Ryan Zinke, secretary of the interior, met with fishermen on Friday to discuss the Northeast Canyons and Seamounts Marine National Monument. Capping off a four-day New England tour, US Secretary of the Interior Ryan Zinke visited Boston Friday to meet with local scientists and fishermen in his review of the East Coast’s only — and highly controversial — marine monument. The Northeast Canyons and Seamounts Marine National Monument, located approximately 130 miles off the coast of Cape Cod, covers more than 4,000 square miles. It includes three underwater canyons and four seamounts — mountains rising from the ocean floor —housing dozens of deep-sea corals and several species of endangered whales. Former president Barack Obama proclaimed the area the country’s first marine national monument in the Atlantic Ocean in September 2016. The Antiquities Act, signed into law in 1906 by national parks champion Theodore Roosevelt, grants presidents unilateral authority to establish national monuments on federal land. But now, under President Trump, the fate of the underwater zone is in doubt. Zinke met with scientists from the New England Aquarium and the Massachusetts marine monument’s superintendent from the US Fish and Wildlife Service in the morning, before heading to a roundtable with local fishermen. “Right now, I’m in the information collection stage, so everything is on the table,” Zinke said. 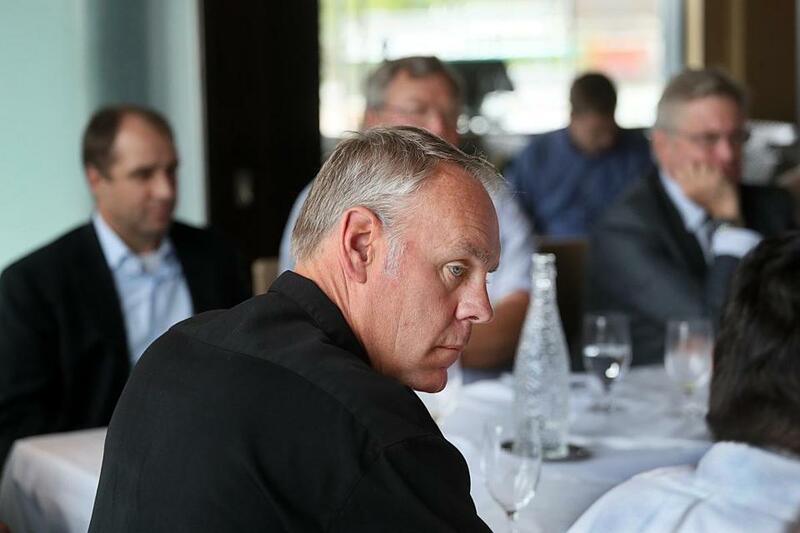 In a backroom at a waterfront Legal Seafoods,about 20 representatives from New England fisheries and fishermen’s associations sought to persuade Zinke to shrink or eliminate the monument. Expressing unanimous disapproval of Obama’s move to use the Antiquities Act to protect the area, they argued that fisheries incur substantial financial losses and fishermen risk their safety by having to steer clear of the protected area. Meghan Lapp, fisheries liaison for Seafreeze, Ltd., said the company has two vessels that had fished for squid, mackerel, and butterfish in the zone since the 1980s. After the area became a monument, Lapp estimated the company lost hundreds of thousands of dollars. Fishermen around the table told similar stories. Fishing industry representatives expressed dismay about what they considered a lack of transparency and engagement with fishermen leading up to the monument’s designation last year. “No one person should have the authority to sign Americans out of work,” said Beth Casoni, executive director of the Massachusetts Lobstermen’s Association. Zinke told fishermen and association representatives that he aims to restore trust between fishing communities and the federal government. “The president has said, give people a voice, make sure we restore trust in the process. And as the secretary, my number-one concern is that there’s a breach of trust between citizens and our government, and we need to repair that,” he said after the event. Members of Senator Elizabeth Warren’s and Senator Ed Markey’s staffs also attended the roundtable, and event organizers pointed out Warren’s opposition to the monument as evidence that promoting fisheries is a bipartisan effort. But across town, members of environmental groups demonstrated in support of what Massachusetts Sierra Club director Emily Norton called a different bipartisan issue: protecting public lands. Rallying on the steps of the State House in support of the monument, activists sang “This Land is Your Land” and held signs reading “Protect New England’s Ocean Treasures.” From their perspective, the monument is essential for protecting the undersea canyons and mountains — and the species that inhabit them — from offshore drilling, mining, and fishing. A March 2017 report by the National Resources Defense Council found that the “monument’s deep and rugged canyon and seamount areas were historically some of the least fished in the US Atlantic and not unusually important for any fishery.” And, as evidence that the federal government considered the perspectives of fishermen, environmental advocates point to town hall meetings before the designation and a caveat in Obama’s order that gave lobstermen and crab fishermen seven years to continue fishing in the area. Earlier this week, Zinke recommended that Trump scale back the Bears Ears National Historic Monument in Utah, another monument that Obama designated under the Antiquities Act. Zinke said he will make a recommendation to Trump on the marine monumentby the end of August. Claire Parker can be reached at claire.parker@globe.com.